4, is a soluble salt of potassium and the dihydrogen phosphate ion which is used as a fertilizer, a food additive and a fungicide. It is a source of phosphorus and potassium. It is also a buffering agent. When used in fertilizer mixtures with urea and ammonium phosphates, it minimizes escape of ammonia by keeping the acidity at a relatively low level. Single crystals are paraelectric at room temperature. At temperatures below −150 °C (−238 °F) they become ferroelectric. 3, at 400 °C (752 °F). Monopotassium phosphate is produced by the action of phosphoric acid on potassium carbonate. 2O, and is labeled NPK 0-52-34. MKP powder is often used as a nutrient source in the greenhouse trade and in hydroponics. As a crystal, MKP is noted for its non-linear optical properties. Used in optical modulators and for non-linear optics such as second-harmonic generation (SHG). Also to be noted is KD*P, potassium dideuterium phosphate, with slightly different properties. Highly deuterated KDP is used in nonlinear frequency conversion of laser light instead of protonated (regular) KDP due to the fact that the replacement of protons with deuterons in the crystal shifts the third overtone of the strong OH molecular stretch to longer wavelengths, moving it mostly out of the range of the fundamental line at ~1064 nm of neodymium-based lasers. Regular KDP has absorbances at this wavelength of approximately 4.7–6.3% per cm of thickness while highly deuterated KDP has absorbances of typically less than 0.8% per cm. ^ Mathews, Christopher K., K. E. Van Holde, Ean R. Appling, and Spencer J. Anthony-Cahill. Biochemistry. Redwood City, CA: Benjamin/Cummings Pub., 1990. Print. ^ a b Ono, Yasuhiro; Hikita, Tomoyuki; Ikeda, Takuro (1987). 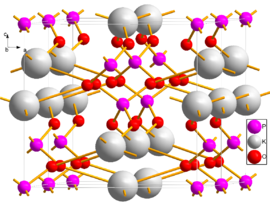 "Phase Transitions in Mixed Crystal System K1−x(NH4)xH2PO4". Journal of the Physical Society of Japan. 56 (2): 577. doi:10.1143/JPSJ.56.577. ^ a b c d "Potassium Dihydrogen Phosphate". American Elements. Retrieved October 30, 2018. ^ a b Fukami, T. (1990). "Refinement of the Crystal Structure of KH2PO4 in the Ferroelectric Phase". Physica Status Solidi A. 117 (2): K93. doi:10.1002/pssa.2211170234. ^ a b Itoh, Kazuyuki; Matsubayashi, Tetsuo; Nakamura, Eiji; Motegi, Hiroshi (1975). "X-Ray Study of High-Temperature Phase Transitions in KH2PO4". Journal of the Physical Society of Japan. 39 (3): 843. doi:10.1143/JPSJ.39.843. Wikimedia Commons has media related to Monopotassium phosphate.